The School for Creative and Performing Arts is a K-12 Cincinnati Public School offering world class pre-professional arts training and advanced college preparatory academics. Approximately 1500 students attend SCPA, which is housed in the new Erich Kunzel Center for Arts and Education in downtown Cincinnati. Artistic Departments include Creative Writing, Dance, Drama, Instrumental Music, Technical Theater, Visual Arts, and Vocal Music. Academic departments include English, Foreign Language, Mathematics, Science, and Social Studies. 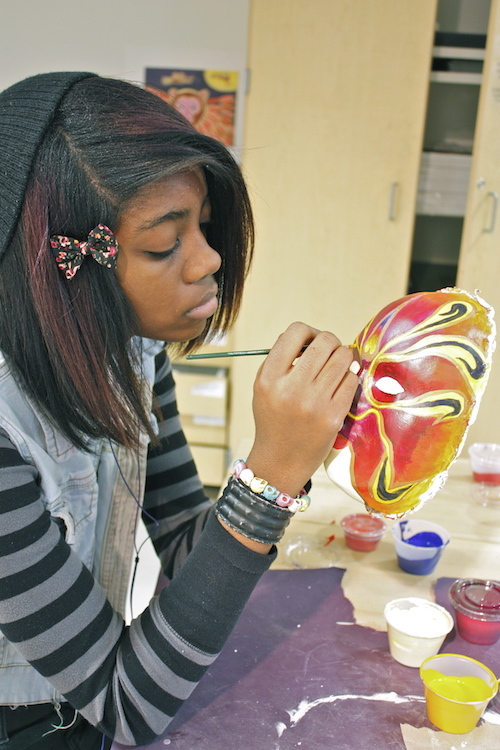 Students entering grades 4 through 12 are admitted through highly selective auditions in the seven artistic majors. Students are permitted to have two artistic majors in selected programs. Arts Proficiency Board Exam Reviews are conducted each semester to ensure that students maintain high artistic standards. Academically, state proficiency test scores at many grades levels are among the highest in the local system. The late Erich Kunzel, beloved conductor of the Cincinnati Pops orchestra, dreamed of creating an arts school near Cincinnati's iconic Music Hall. At the same time, CPS' two arts schools were in dire need of new homes. The dream and the need came together to create the new SCPA for grades K-12. Led by Maestro Kunzel, private fundraising gathered almost half of the $72-million price tag for SCPA's new home, inside Over-the-Rhine's distinctive new landmark named the Erich Kunzel Certer for Arts and Education. The student body is the most diverse in the region. Our student body is made up of African American, Hispanic, Asian, Central and Eastern European, Native American, and multi-racial students from a variety of economic backgrounds. Approximately 5% of the students live outside the public school district (including the neighboring states of Kentucky and Indiana). Students and their families often move into the Cincinnati Public School District to attend SCPA. Arts classes are interspersed throughout the day. Each class meets daily for one or two periods of approximately 45 minutes each. Many students take electives in their majors as well as the required courses. Students must have at least 8 art credits for graduation, and they must maintain good standing in an arts major. Upper level performance majors audition for participation in showcase ensembles including Dance Ensemble, Drama Ensemble, Chamber Orchestra, Symphonic Wind Ensemble, Senior Jazz Ensemble, Chorale, Meridian 8 Vocal Ensemble and Baby Grands Vocal Ensemble. 4th-12th grade students have the opportunity to audition for age appropriate major productions including the Major Musical (5-12th grade), High School Drama (9th-12th grade), Junior High Drama (7th-9th grade), and Elementary Drama (4th-6th grade). All K-3 students participate in their grade level musical production. Private music lessons are available to any student who attends SCPA. In an average school year, over 125 student performances are presented at SCPA.